After a divided U.S. Supreme Court twice temporarily halted the execution of Ronald Bert Smith, Jr. (pictured), Alabama put Smith to death on December 8 in a 34-minute execution in which Smith heaved, coughed, clenched his left fist, and opened one eye during one 13-minute period. Smith's jury had recommended by a vote of 7-5 that he be sentenced to life without parole, but, in a practice permitted by no other state, his trial judge overrode that recommendation and sentenced Smith to death. 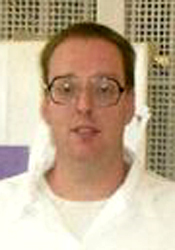 At the time his execution was scheduled to begin, Smith had a stay motion and a petition for certiorari pending in the U.S. Supreme Court arguing that judicial override violated his Sixth Amendment right to a jury trial and was unconstitutionally arbitrary under the Eighth Amendment. After Alabama announced its intention to proceed with the execution despite the pending petition, Justice Thomas granted a temporary stay, a procedure to allow time for the full Court to act. Half the Court—enough to review a case—voted to grant Smith a stay, but five votes are required to halt an execution. Smith's lawyers then filed a motion for reconsideration, criticizing as arbitrary the rule that allows four votes to grant review of a case, but requires five to stay an execution. His motion argued that when four justices vote to hear a case, "all certiorari petitioners, public and private parties in civil and criminal cases of every kind" are entitled to have their cases reviewed except condemned prisoners facing an imminent execution. He asked the Court to reconsider his stay motion "[b]ecause the Court’s inconsistent practices respecting 5-4 stay denials in capital cases clash with the appearance and reality both of equal justice under law and of sound judicial decision-making." Justice Thomas granted another temporary stay so the full Court could consider that motion; after about an hour, the Court denied the request and also rejected a last-minute challenge to the state's lethal injection procedure. Alabama used a three-drug procedure in its execution, beginning with midazolam, a sedative that has contributed to botched executions in several other states and that was the subject of a challenge before the Supreme Court in 2015. Though midazolam is intended to render the inmate unconscious and therefore protect against the pain and suffering that would be experienced from the second and third drugs, witnesses reported that Smith showed signs of consciousness after it was administered. (K. Faulk, "Alabama Death Row inmate Ronald Bert Smith heaved, coughed for 13 minutes during execution," AL.com, December 8, 2016; T. Nashrulla, C. McDaniel, and C. Geidner, "Alabama Executes Inmate After Split Supreme Court Allows It To Proceed," BuzzFeed News, December 8, 2016; A. Howe, "Divided court allows Alabama execution to proceed," SCOTUSblog, December 9, 2016; E. Freedman, "No Execution If Four Justices Object," Hofstra Law Review, April 14, 2015.) Read Ronald Smith's U.S. Supreme Court motion for reconsideration here. See Arbitrariness and Lethal Injection.